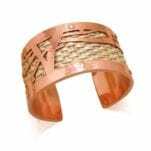 Jerry Gaussoin Sunrise Bracelet Jerry Gaussoin is a member of the renowned Gaussoin jewelry innovating family. This bracelet shows the rays emanating from the morning sun as it rises over the horizon. The bracelet is made from sterling silver. While the rays of the sun are etched and oxidized, the sun itself is shiny; reflections in the picture make it appear dark. The bracelet will fit a wrist of approximately 7 inches. The opening is around 1 5/8 inches. JJ Otero Fire Warms Me Bracelet A handsome stamped sterling silver bracelet, inscribed on the inside: "Mom and Dad's Fire Warms Me." JJ Otero is a musician and artist of Navajo and Hopi ancestry. While metalsmithing is a recently discovered endeavor for him, he is a natural. He designs and makes beautiful designs inscribed with words inspired by the contemporary resistance movement as well as personal thoughts. The bracelet is 7 inches inside circumference, including 1 1/4 inch opening. It is 1/4 inch wide. David Gaussoin Cast Sterling Silver Bracelet David Gaussoin, of the renowned Gaussoin jewelry innovating family, cast this bracelet and created a dark, textured finish with highlights of shiny silver. Two beads of quartz with black inclusions complete the look. The bracelet should fit a wrist of approximately 6 3/4 inches. The opening is around 1 1/2 inches. The curved shape makes for a comfortable fit. JJ Otero We Remain Bracelet A handsome, hefty bracelet hand-scribed with the following on the inside surface: "We fought. We survived. We remain." JJ Otero is a musician and artist of Navajo and Hopi ancestry. While metalsmithing is a recently discovered endeavor for him, he is a natural. He designs and makes beautiful designs inscribed with words inspired by the contemporary resistance movement. The bracelet is 7 3/16 inches inside circumference. It is 1/4 inch wide and 1/4 inch thick. JJ Otero Resisting Bracelet A stamped sterling silver bracelet, hand-scribed with the following on the inside surface: 1492, 1868. Still here. Resisting. JJ Otero is a musician and artist of Navajo and Hopi ancestry. While metalsmithing is a recently discovered endeavor for him, he is a natural. He designs and makes beautiful designs inscribed with words inspired by the contemporary resistance movement. The bracelet is just under 7 inches inside circumference, including a 1 1/4 inch opening. It is 1/2 inch wide. Adrian Wall Inlaid Glass Bracelet Adrian Wall is perhaps best known for his award-winning stone sculptures. His inlaid glass jewelry is a fine addition to his repertoire. This bracelet will awaken your senses with its bright colors and high inlay. 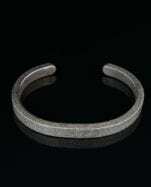 The interior circumference of the bracelet is deep stamped with geographic shapes and with the artist's hallmark. Bracelet circumference is 6 1/4 inches in total, which includes a 1 1/4 inch opening. It is 1/2 inch wide. 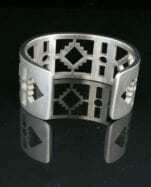 Chris Pruitt Textured Silver Bracelet Christopher Pruitt has won a number of awards in his rising career, including Best of Classification for jewelry at the Santa Fe Indian Market. The surface of this sterling silver bracelet is beautifully textured with bubble shapes and diagonal straight lines. The bracelet is 1/4 in. wide. It will fit a 6 1/2 in. wrist and has a 1 in. opening. Chris Pruitt Mountain Bracelet Christopher Pruitt has won a number of awards in his rising career, including Best of Classification for jewelry at the Santa Fe Indian Market. This is an early bracelet of Mr. Pruitt's, a rare opportunity to obtain such a piece. The polished sterling silver on the bracelet represents mountains, bright against a dark sky. Two turquoise cabochons and one coral adorn the landscape. On the interior of the bracelet is stamped a winding path with dwellings along the way on both sides. Inside circumference of the bracelet is 6 1/2 in., including a 1 1/4 in. opening; bracelet is 3/4 in. wide. Jeff DeMent Turquoise Bracelet Sterling silver tufa cast bracelet with a turquoise cabochon with beautiful matrix. Round shapes combined with pointed shapes, circles and linear designs, add up to a stunning design.The bracelet will make a wonderful statement on your wrist! Bracelet will fit a 6 1/4" wrist; opening is 1". 1 1/4" wide at the top, tapering to 1/2" at the tips. Dallen Plummer Cast Bracelet Dallen Plummer, born in 2000, is the second oldest of Earl Plummer's children. Following in his father’s footsteps, he is making beautiful jewelry at a young age. This tufa cast sterling silver bracelet has geometric designs as well as a very attractive turquoise cabochon. The bracelet is hefty and will hold up to a lot of use. Inside circumference is 6 7/8", including a 1 1/8" opening. The silver is 11/16" wide; 2 3/8" wide including the stone. Chris Pruitt tapered bracelet Christopher Pruitt has won a number of awards in his rising career, including Best of Classification for jewelry at the Santa Fe Indian Market. 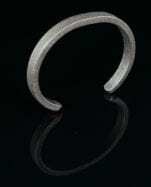 The surface of this sterling silver bracelet is beautifully textured, creating great interplay of sparkle and shadow. The bracelet tapers from 1" wide at the center to 1/2" wide at the ends. It will fit a 6 3/4" wrist and has a 1 1/4" opening. Because it has no stone, there is some leeway in bending it to fit. Earl Plummer inlaid silver bracelet with lapis lazuli. Earl Plummer, winner of the Best of Jewelry award at the 2013 Santa Fe Indian Market, is showing his talent in design as well as workmanship. Read more about the artist here. This bracelet is inlaid with lapis lazuli with bursts of color including coral, spiny oyster shell, turquoise, and sugillite. It is stunning! 6 1/2" inside circumference, including 1 1/8" opening; 1 1/8" wide, tapering to 7/8"
Kevin Pourier Buffalo Horn Floral Cuff Bracelet Kevin Pourier meticulously carves buffalo horn surfaces and inlays them with crushed stone and shell. Buffalo horn is so light, the jewelry is featherweight. The jewelry is finished beautifully, adding a soft, satin touch to the experience. Pourier has won a number of awards at the Heard Museum Guild Indian Market and Fair as well as the Santa Fe Indian Market, including an Innovation award. Materials: buffalo horn inlaid with crushed lapis lazuli, mother of pearl (white and gold), malachite, and coral. Sterling silver findings. Bracelet will fit wrists up to 6 1/2 in. ; 1 1/2 in. at widest. This bracelet comes back to us from the secondary market; it was made in 2006. 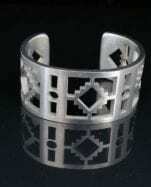 Earl Plummer Multi-Material Wide Link Bracelet Earl Plummer is an award-winning Navajo silversmith. He won Best of Classification in Jewelry at the Santa Fe Indian Market in 2013. This sterling silver bracelet includes the following materials in a beautiful array of color: spiny oyster shell, coral, lapis lazuli, variscite, turquoise, and sugillite. At 6 1/2 in. in length, it will comfortably fit a wide variety of wrist sizes. The bracelet is secured by a hand forged clasp as well as a chain. Bracelet tapers from 3/4 in. wide to 3/8 in. wide. Althea Cajero Cuttlefish Cast Bracelet This cuttlefish cast bracelet uses texture and shape to create a beautiful design. The cuttlefish cast creates stunning light and shadow for an elegant, dressy bracelet that is sturdy enough to be worn every day. 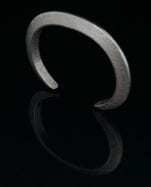 Cajero's tapered design with steps at one end enhance the beauty of the bracelet. 6 1/4" inside circumference, including 1 1/8" opening (at its narrowest point); 3/4" wide, tapering to 1/2" on the narrower tip. Margaret Jacobs Cuff Bracelet Margaret Jacobs makes boldly colored jewelry with a contemporary flair. 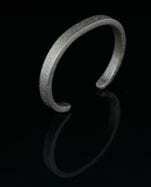 This bracelet is made from powder-coated steel. The powder coat provides a finish that is stable and durable. Choose a color to view size above shopping cart button. Jeff DeMent Tufa Cast Bracelet Sterling silver tufa cast bracelet. Tufa casts are prepared by carving shapes into porous volcanic stone and pouring molten silver into them. DeMent creates one of a kind casts; he does not reuse the molds.The surface of the finished product reflects the porosity of the mold. The pebbled surface is uniform across the outside of the bracelet. This band has a rectangular shape. It will fit a 6 1/4" wrist; it has a 1" opening. It is 5/16" wide and 1/4" thick. Jeff DeMent Tufa Cast Bracelet Sterling silver tufa cast bracelet. Tufa casts are prepared by carving shapes into porous volcanic stone and pouring molten silver into them. DeMent creates one of a kind casts; he does not reuse the molds.The surface of the finished product reflects the porosity of the mold. The pebbled surface is uniform across the outside of the bracelet. This band has a rectangular shape. It will fit a 6 3/4" wrist; it has a 1" opening. It is 1/4" wide and 1/4" thick. Jeff DeMent Tufa Cast Bracelet Sterling silver tufa cast bracelet. Tufa casts are prepared by carving shapes into porous volcanic stone and pouring molten silver into them. DeMent creates one of a kind casts; he does not reuse the molds.The surface of the finished product reflects the porosity of the mold. The pebbled surface is uniform across the outside of the bracelet. This has a triangular shape. It will fit a 6 1/4" wrist; it has a 1" opening. It is 1/4" wide and 1/4" tall. Chris Pruitt Turquoise Bracelet Christopher Pruitt has won a number of awards in his rising career, including Best of Classification for jewelry at the Santa Fe Indian Market. The surface of this sterling silver bracelet is textured with wavy lines, creating a wonderful backdrop for the brilliant natural turquoise cabochon. The 18K gold bezel also helps to set the stone off beautifully. 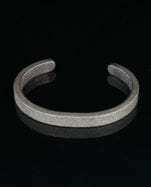 At 1/8" thick and 5/8" wide, this is a substantial bracelet. It will fit a 7" wrist and has a 1 3/8" opening. Chris Pruitt textured bracelet Christopher Pruitt has won a number of awards in his rising career, including Best of Classification for jewelry at the Santa Fe Indian Market. The surface of this sterling silver bracelet is cross-hatched, creating a beautiful texture. At 1/8" thick, this is a substantial bracelet. Because it has no stone, there is some leeway in bending it to fit. The bracelet is 1/2" wide. It will fit a 7" wrist and has a 1 3/8" opening. Joe Cajero, Jr. is a highly accomplished sculptor. Winner of many awards, in 2014, Joe and his wife Althea were named Living Treasures at the Native Treasures show, sponsored by the Museum of Indian Arts & Culture in Santa Fe. Read more... This bracelet includes a number of symbols from Cajero's Natural Divinity Series, including the following: The stars represent the vastness of the Heavens. They also represent the three levels of creation: conscious, subconscious, and the superconscious I also refer to this as body, mind, and spirit. The wave pattern represents water's life-giving properties, fluidity, and an openness for prosperity and wisdom to flow into one's life. The dragonflies represent the masculine essence of life, and the butterflies represent all that is feminine. Each goes through its own metamporphosis. I use them as symbols of change as we grow into new levels of awareness about life. The four circles of various sizes represent souls waiting to be conceived in their unique stages of spiritual evolution. The larger souls have attained higher levels of wisdom. The steps represent an altar, a place of Oneness, prayers and meditations of the male and female. 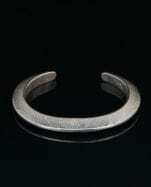 This cast bracelet is 3/16" thick; it is solid and is made to last a lifetime. It will fit a 6 1/2" to 6 3/4" wrist, with a 1 3/8" opening. It is 3/8" wide. Note that you are seeing a reflection of the bracelet, which may lead you to believe it is wider. The symbols are in bas relief against an oxidized background. The dark background is more uniform than the images show; the camera picks up reflections that are generally not visible to the human eye. Blue Diamond turquoise has not been mined since the 1970's, so it is difficult to obtain. 7" inside circumference, including 1" opening; will fit a wrist of approximately 6 3/4" to 7"; 1 1/8" wide, tapering to 7/8"
Earl Plummer, winner of the Best of Classification award for jewelry at Santa Fe Indian Market in 2013, has created a stunning cuff bracelet with natural Morenci turquoise inlay. Shades of blue with pyrite and other inclusions mark this seemingly simple but beautiful and elegant bracelet. Inside circumference of approximately 6 5/8" includes a 1 1/4" opening. Bracelet is 1/4" wide. Christopher Pruitt has won a number of awards in his rising career, including Best of Classification for jewelry at the Santa Fe Indian Market. 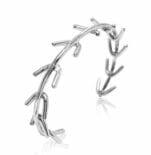 The surface of this sterling silver bracelet is beautifully textured to resemble a web, perhaps a vine. The bracelet is 1/4" wide. It will fit a 7 3/8" wrist and has a 1 1/2" opening.